Karen Gillan stars as a woman dedicated to clearing her brother's name by proving the murders he's accused of were committed by an evil mirror. Brenton Thwaites and Katee Sackhoff co-star; Mike Flanagan directs. Read our review here. For more freaky features fronted by females check out this terrifying trio. 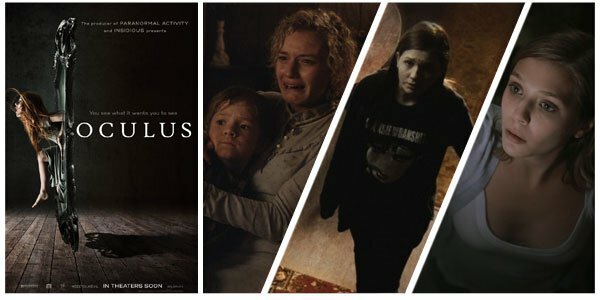 Whether it’s a sister-centered tale about a twisted family tradition, a mystery to be unraveled by a teen girl caught in a time loop, or an ambitious indie following a haunted young woman, each of these films should satisfy your thirst for the macabre. We Are What We Are (2013) This American remake of the 2010 Mexican offering Somos Lo Que Hay embeds itself deep in the Catskills of New York. There the Parker family lives on the fringe of society, preparing for a grim annual ritual. But when their mother dies unexpectedly, the eldest daughter is expected to take her role in the ceremony, a responsibility she may not be ready to handle. Nick Damici, Ambyr Childers, and Julia Garner star; Jim Mickle directs. Haunter (2013) From Vincenzo Natali, the helmer of such fascinating horror stories as Cube and Splice, comes this creepy mystery that spooked audiences at last year's South by Southwest festival. Abigail Breslin stars as sulky '80s-era teen Lisa, who is trapped in an endless cycle of the day before her 16th birthday. Her investigation into this loop leads her down a mind-bending rabbit hole that challenges her very perception of reality, life and death. Stephen McHattie, David Hewlett, and Samantha Weinstein co-star. Silent House (2011) Elizabeth Olsen fronts this Sundance-selected thriller inspired by the Uruguayan La Casa Muda. In it she plays, Sarah, who has returned to her family's lake house with her uncle and father to prep it to be sold. But this is no summery homecoming. As soon as she steps through the doors, Sarah senses she is being stalked by someone or something she can't escape. Adam Trese and Eric Sheffer co-star; Chris Kentis and Laura Lau direct. Scarlett Johansson stars as Laura, an extraterrestrial predator who exploits her sexual wiles to lure the unsuspecting men of Scotland into her web. But being so close to humanity makes her crave some of her own. Jonathan Glazer directs. Read our review here. Glazer's Under The Skin is already being held up as a masterpiece of mind-bending science fiction. 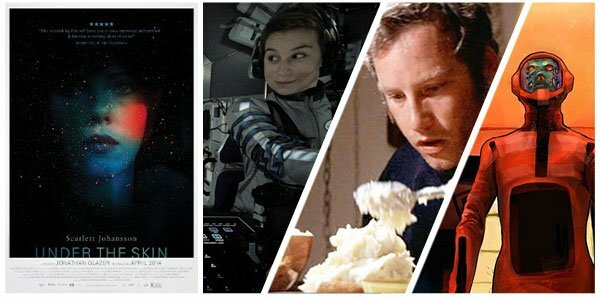 For more sci-fi features that defy expectation and offer mind-blowing tales, make a marathon of these titles about space exploration, alien encounters and the mysteries of the human brain. Europa Report (2013) Shamefully this compelling and truly chilling science-fiction thriller got little notice when it hit last year. But take the opportunity to see it now. Director Sebastian Cordero breathes new life into the tired trope of found footage with this chronicle of six astronauts and their mission to explore Jupiter's fourth largest moon. Europa has water, could it also hold life? Sharlto Copley, Michael Nyqvist, Christian Camargo, and Karoline Wydra co-star. Close Encounters of the Third Kind (1977) The Stephen Spielberg classic is streaming! Richard Dreyfuss stars as a line worker whose ordinary life is thrown into spin when he is witness to something out of this world. Having been contacted, he--and those like him--are drawn to a wilderness destination for a world-changing encounter. Teri Garr and Bob Balaban co-star; Spielberg directs. Beyond the Black Rainbow (2010) Under The Skin has been drawing a lot of tonal comparison to this wild film that made festival rounds a few years back. Eva Bourne stars as Elena, a telepathic teen who tries to escape the clutches of her unbalanced therapist and the strange facility where he holds her prisoner. Michael Rogers, Scott Hylands, Marilyn Norry, and Rondel Reynoldson co-star; Panos Cosmatos directs. Blu and Jewel are living the high life in Rio de Janeiro with their three kids. But when Julia and Tulio discover a long lost tribe of Blue Macaws in the wilds of the Amazon rainforest, this flighty family decides it's time for a road trip! Jesse Eisenberg, Anne Hathaway, Jemaine Clement and Kristin Chenoweth lend their voices; Carlos Saldanha directs. Read our review here. 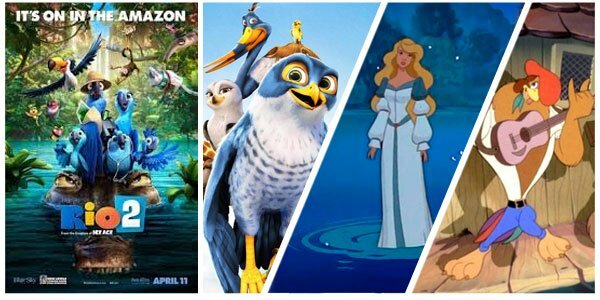 For more family-friendly features about our feathered friends, we recommend these three animated films led by an adventurous falcon, a swan princess, and a rock-lovin' rooster. Adventures in Zambezia (2012) Kai is a young falcon bored by his rural home. Against his father's wishes, he takes flight to find the legendary bird city of Zambezia. But his new life is not one free of responsibilities. When the city falls under attack of a bird-craving lizard, it's up to Kai to save the day. Jeremy Suarez, Leonard Nimoy, Abigail Breslin, Jeff Goldblum and Samuel L. Jackson lend their voices; Wayne Thornley directs. The Swan Princess (1994) Based on the tale of Swan Lake, this adventure centers on Princess Odette, who has been cursed by a vile sorcerer to spend her days as a swan. But the love of a handsome prince--and the help of her animal friends--might be all she needs to break this wicked spell. Jack Palance, Liza Callaway, John Cleese, and Steven Wright lend their voices; Richard Rich directs. Rock-A-Doodle (1991) Ever imagine what Elvis would look like as a rooster? The makers of this funky and fun film did. Chanticleer is a spirited singer whose song brings the sun to the farm each morning. But when he's shamed, he flees to the city, leaving those left behind to live in endless night. Now a motley crew of creatures band together to recover their rooster friend and save the farm by bringing back the sun. Glen Campbell, Eddie Deezen, Toby Scott Ganger, Christopher Plummer, and Ellen Greene lend their voices; Don Bluth, Gary Goldman, and Dan Kuenster direct.